The conflict between the pressure of immediate business demands and activities that position the company for the future is a central tension in most engineering organizations. Engineering leaders have all experienced situations where we feel that we do not have enough time to think, develop better ways of working, or develop new products and services. Not enough ‘head room’! The ability of the engineering organization to deliver primarily contributes to the profitability of the firm. The ability of the engineering organization to innovate contributes to the growth and competitiveness of the firm. All are critical to the long run sustainability of the business. 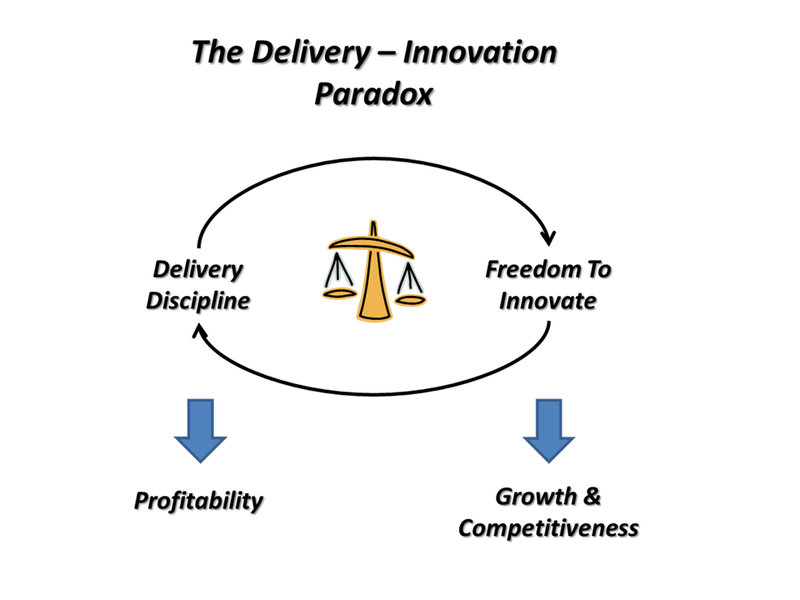 We call this the ‘Delivery – Innovation’ paradox. Getting the balance right is crucial for any business. Focus too much on delivery and profitably go out of business from tired products, a surprise move by a rival, or a market change. Focus too much on innovation and become unprofitable while growing too fast with too many new products or unwisely investing in poor choices for development activities. This blog will explore the ‘Delivery – Innovation’ paradox in engineering and knowledge work in future posts. This entry was posted in Innovation on January 12, 2013 by Andrew Reif.